Click here to return to the lecture list. Karst is a landscape that is distinguished by underground drainage and is normally formed on limestone or gypsum. 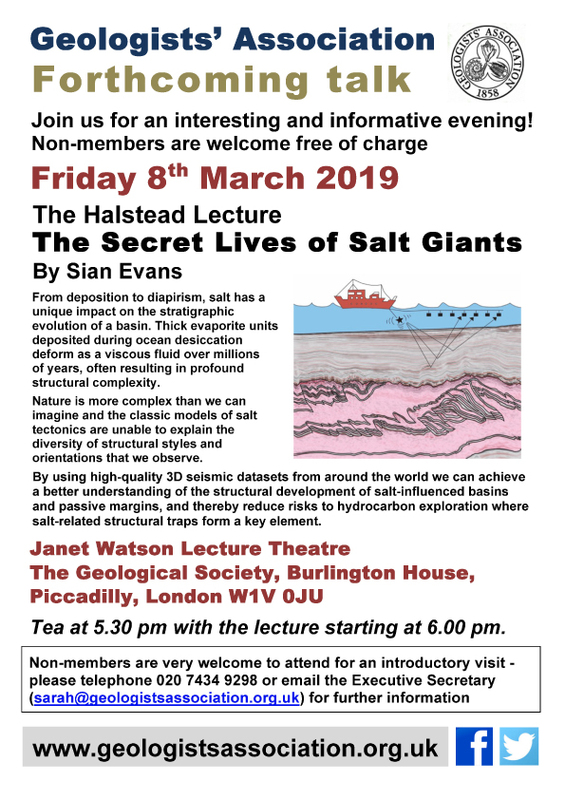 Its impact on engineering geology is the distinctive suite of karst geohazards, which are largely related to the hole in the ground of varying size and unpredictable nature. 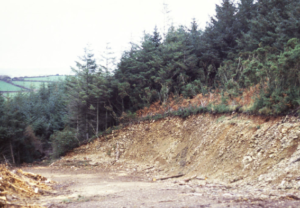 The most widespread and frequent geohazard is the development of new sinkholes within the soil profile over a cavernous limestone; they develop by suffosion, where soil is washed down into cavities in the stable rock. 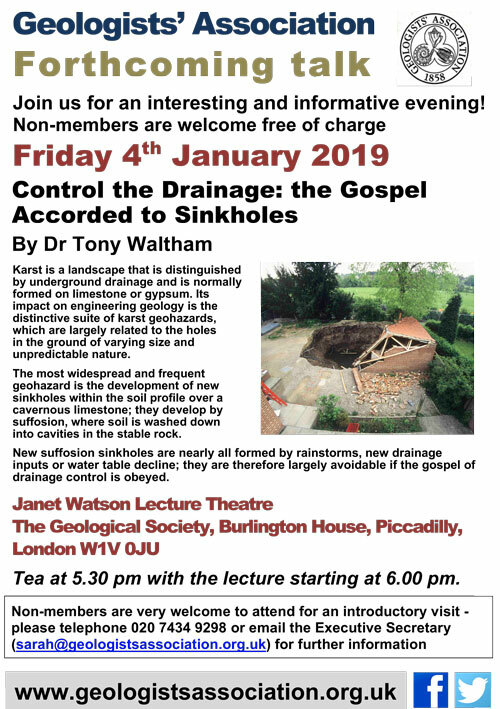 New suffosion sinkholes are nearly all formed by rainstorms, new drainage inputs or water table decline; they are therefore largely avoidable if the gospel of drainage control is obeyed. The area has produced a wide range of interesting mineral specimens. Examples of these are to be found in local and regional museum collections, and especially at the Natural History Museum in London. However, such was the importance of Britain in the development of mineralogy as a science that specimens from the English Midlands are to be seen in collections all over the world. Minerals such as phosgenite, matlockite and mottramite are recognised as having been first described from the English Midlands. 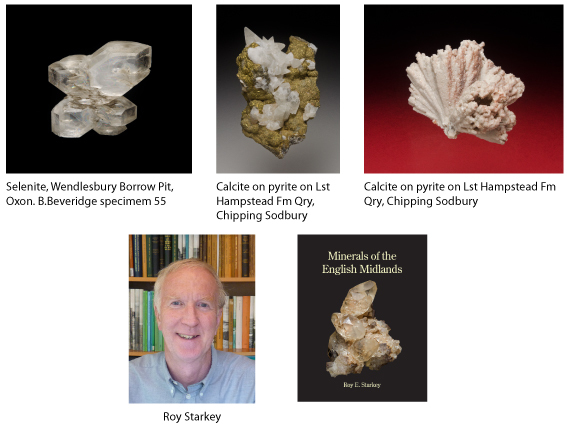 Although the glory days of mining are long gone, quarrying operations, especially in Derbyshire, Gloucestershire, Leicestershire and Shropshire mean that fresh exposures are constantly being created, and new mineralogical discoveries continue to be made today. Thanks to the efforts of miners, mineral dealers and collectors over the past few hundred years, interesting and beautiful specimens have been preserved for us to enjoy today. 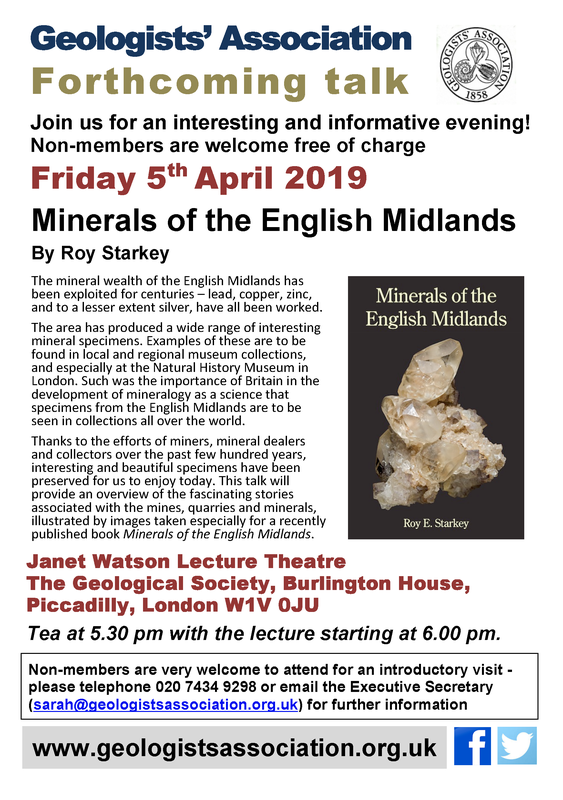 This talk will provide an overview of the fascinating stories associated with the mines, quarries and minerals, illustrated by images taken especially for a recently published book Minerals of the English Midlands. The Himalaya is the highest and the youngest mountain range on the Earth. Around 55 million years ago the northward drifting Indian sub-continent collided with Asia and thus gave rise to the Himalayan mountain range. The Himalaya is still rising and will most probably continue to rise in the future for some time to come, but for how long and how high? 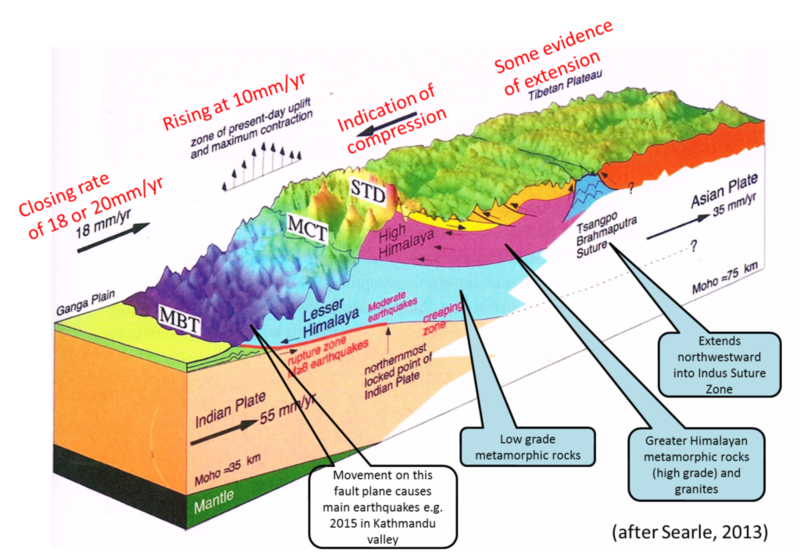 Four major tectonic zones can be identified, divided mainly by major thrust planes (Fig.1): – the sub-Himalaya along the stable foreland of the Indian plate – the Lesser Himalaya, low-grade metamorphic rocks above the active front of the Himalaya, the Main Boundary Thrust (MBT) – the Greater Himalaya, the metamorphic core of the Himalaya above the Main Central Thrust (MCT) and below the low – angle normal fault of the South Tibetan Detachment (STD) – the Tethyan Himalaya, the unmetamorphosed upper crust of the Indian plate, above the STD. This zone represents the Tethyan passive continental margin of the Indian plate prior to the collision with Asia . Evidence exists that the northerly thrusts were active before the more southerly thrusts but how predictable is this, and what implications are there for earthquake prediction? If the MBT is thought to be the origin of the 2015 earthquake, what was the role of the more southerly Main Frontal Thrust? This mountain range experiences various types of natural hazards including earthquakes, landslides, avalanches, debris flows, floods etc. 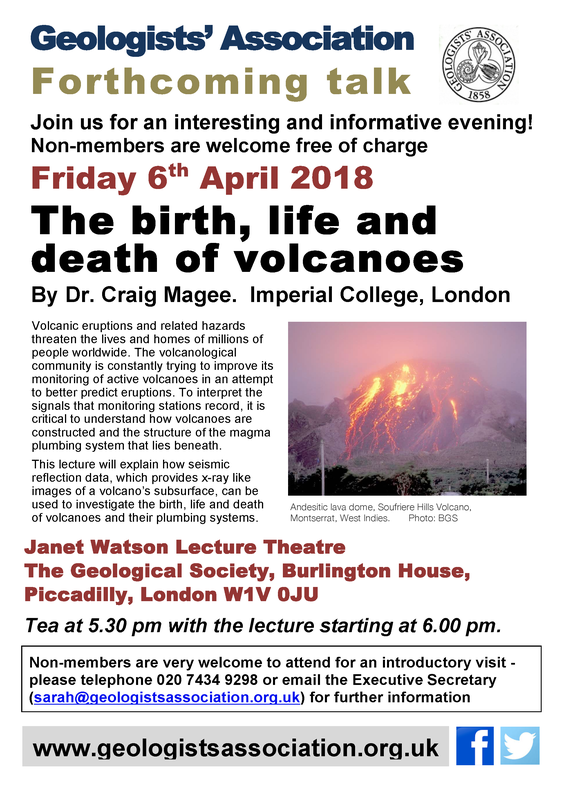 Its physiography, geology, and climate control the type and extent of natural hazard in each climatic zone, but what can Man do to ameliorate the devastation wrought by these processes? The Himalaya is an ideal natural laboratory that provides a unique opportunity to study both geological processes of mountain building and natural hazards; but it is also a mountain range that rarely gives up its secrets easily . A sceptical look at the Dino-Bird controversy. To most interested lay-people and even most vertebrate palaeontologists the theory that birds arose from a group of Theropod dinosaurs is now regarded as an incontestable fact. However there are a handful of dissenters from this supposed certainty. The speaker is one. Mike will start by outlining the position of Archaeopteryx as the quintessential example of an intermediate between two classes of organisms – reptiles and birds, before considering the various theories which have been put forward to explain which group of reptiles could best be considered the direct ancestor of the avian lineage. 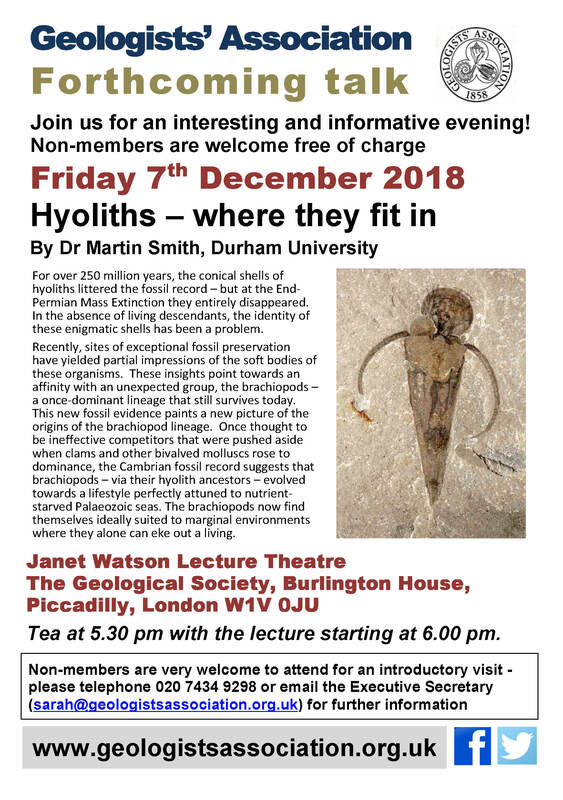 We will then look at the work of Professor John Ostrom who posited Deinonychus antirrophus, the prototype ‘Raptor’, as the putative bird-ancestor by comparing its osteology with that of Archaeopteryx. However, there are many more differences than similarities. The final half of the talk will concentrate on two alleged dino-birds which featured prominently in the recent exhibition ‘Dinosaurs of China’ in Nottingham. Sinosauropteryx prima, a compsognathid dinosaur which is supposed to exhibit PROTOFEATHERS and Microraptor gui the alleged four winged flying dinosaur which is an archaeopterygiform bird and not a dinosaur. A more parsimonious ancestor for the avian lineage will be suggested. 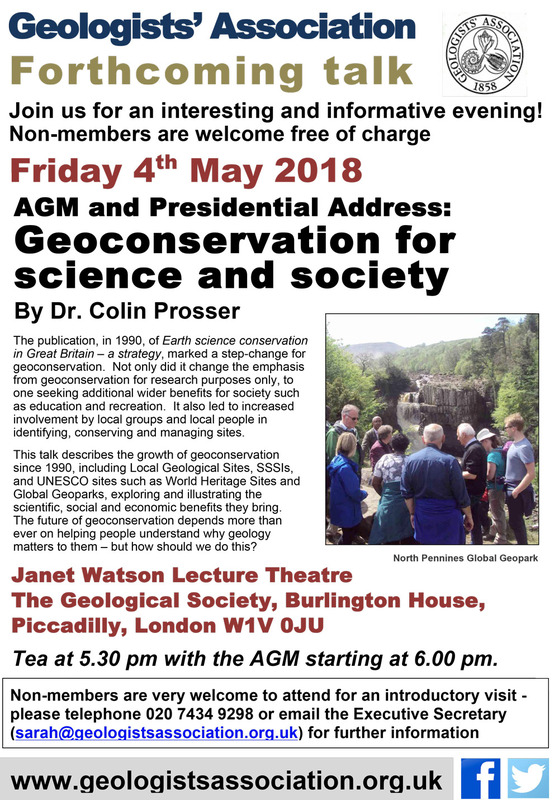 A keen extramural class in Swansea University requested that a future course should involve more fieldwork, so a course was devised that involved the geological mapping an area of little-known ground in Carmarthenshire. The results of this mapping exceeded all expectations, with major discoveries resulting from some of the first forays into the area. 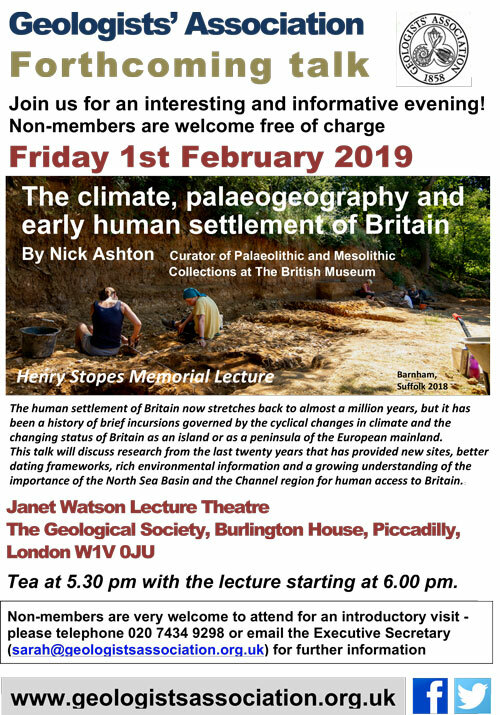 These were only the precursors to further major finds, resulting in the discovery of the earliest examples of several fossil groups and the discovery of new outcrops of some of the oldest rocks and the oldest fossils in Wales. The fossil finds in the area have had major influence on ideas of the early evolution of some fossil groups. 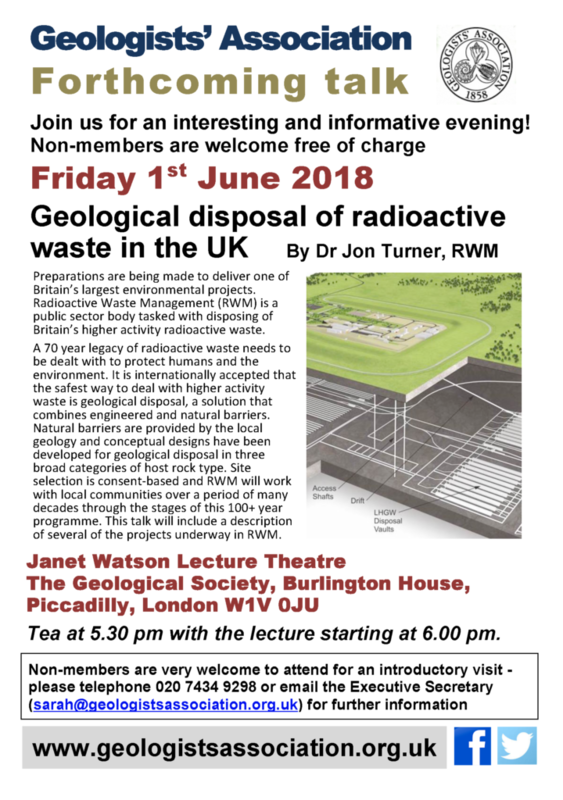 Radioactive Waste Management (RWM) is a public sector delivery body tasked with disposing of Britain’s higher activity radioactive waste. A complex 70-year legacy of radioactive waste needs to be dealt with to protect humans and the environment. It is internationally accepted that the safest and most sustainable way to deal with higher activity waste is geological disposal, emplacing the waste in a geological disposal facility (GDF) so that people and the environment are protected from the harmful properties of the waste. 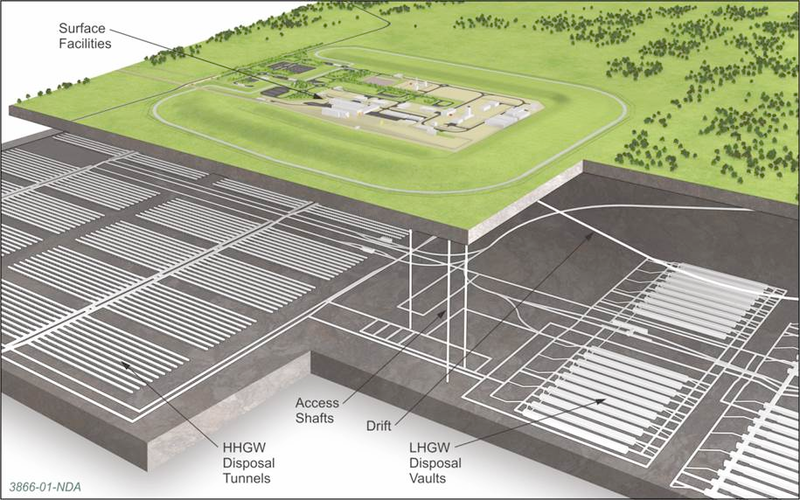 Geological disposal combines engineered and natural barriers to isolate a GDF from humans and surface processes, and to prevent migration of radionuclides toward the surface. Natural barriers are provided by the geology in which the GDF will be hosted, and any overlying low-permeability sedimentary layers. Conceptual designs have been developed for geological disposal in three broad categories of host rock type: fractured Higher Strength Rock (HSR), very low-permeability Lower Strength Sedimentary Rock (LSSR) and Rock Salt. Examples from overseas include Finland and Sweden where granitic HSR is the host rock for GDFs they are developing, Mesozoic LSSRs are the host in France and Switzerland, and the WIPP facility in New Mexico is constructed in Permian rock salt. Site selection is consent-based and RWM will work in partnership with local communities over a period of many decades through the site selection, site investigation and construction stages of this 100+ year programme. This talk will include a description of several of the projects underway in RWM as it prepares for the launch of the site selection process, and builds capability in readiness for detailed site investigations. 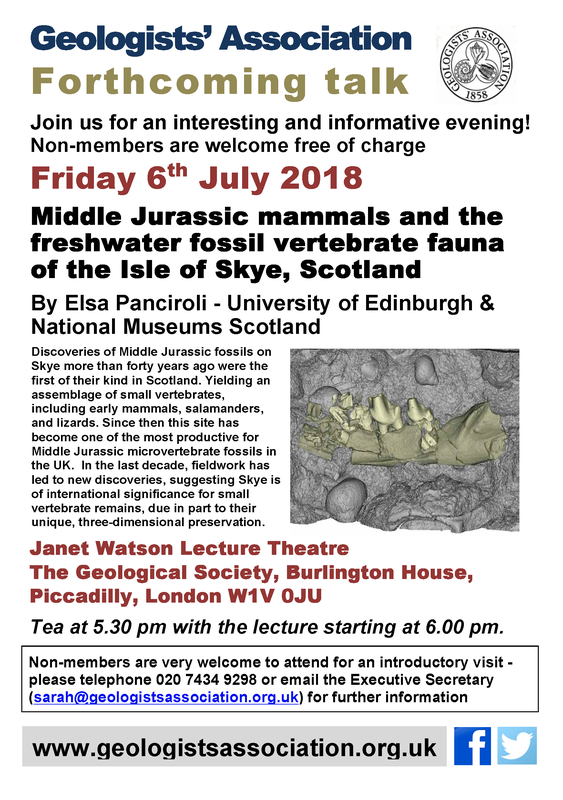 Discoveries of Middle Jurassic (Bathonian) fossils on Skye more than forty years ago were the first of their kind in Scotland. Yielding an assemblage of small vertebrates, including early mammals salamanders, and lizards. 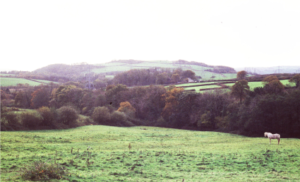 Since then, the Kilmaluag Formation, in which they were found, has become one of the most productive sites for Middle Jurassic microvertebrate fossils in the UK. Previously, such fossils came almost exclusively from deposits in England, notably the Forest Marble Formation, Oxfordshire. In the last decade, fieldwork by a multi-institutional team led by researchers from National Museums Scotland and the University of Oxford has led to new and significant discoveries, suggesting Skye is of international significance for small vertebrate remains. While other Middle Jurassic deposits on Skye represent marine to brackish environments, the Kilmaluag Formation is predominantly freshwater; a non-saline lagoon environment not unlike the Florida Everglades today. This depositional setting preserves some of the most complete Jurassic mammal skeletons outside China. Unlike similar-aged sites in England, and Late Jurassic sites in Portugal and North America, microvertebrate fossils from the Kilmaluag Formation are most often recovered as associated skeletons, or associated skeletal elements. This is partly taphonomic, but is also the result of the resistance of the limestone matrix to bulk processing. Specimens are instead found by eye, cut from the exposure, and visualised using micro-CT and synchrotron scans. This process preserves their positions within the matrix, and causes minimal damage, in contrast to the disarticulated remains picked-through after bulk processing. The unique, three-dimensional preservation of mammals from the Kilmaluag Formation provides new insights to early mammal diversity, anatomy and ecology. Research currently underway on this internationally significant fossil material will add much-needed detail to our increasingly vivid picture of the rich ecosystems of the Middle Jurassic. Bio – Elsa Panciroli is a palaeontologist at National Museums Scotland and the University of Edinburgh. She is currently completing her PhD on the origin and evolution of mammals, focusing on the exquisite fossil mammal material found on the Isle of Skye. She is a member of two research teams working on fossils from Skye, and is the first female member of PalAlba. Elsa also writes for various science publications, as well as The Guardian newspaper, addressing topics in palaeontology and evolution. 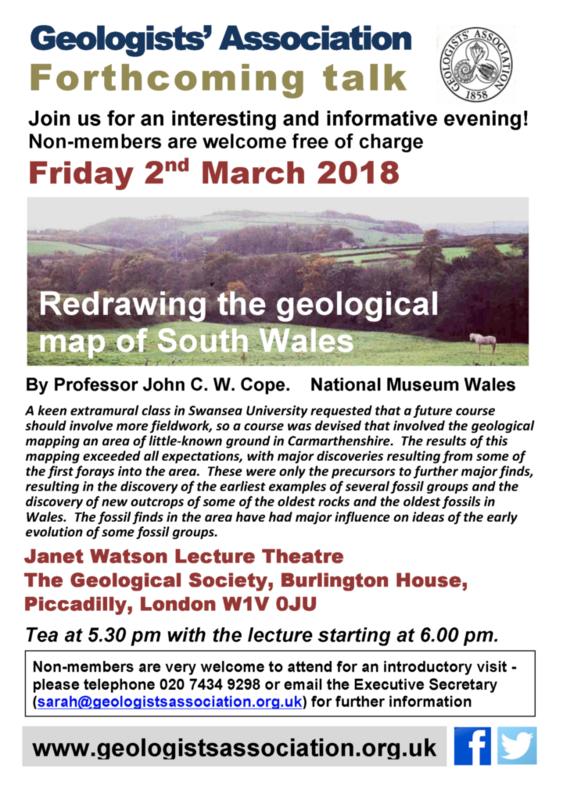 October 5 – Redrawing the geological map of South Wales — Professor John C. W. Cope, National Museum Wales, Cardiff. 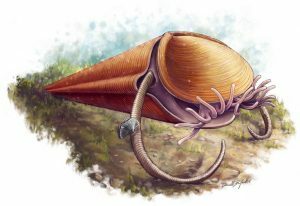 For over 250 million years, the conical shells of hyoliths littered the fossil record – but at the End-Permian Mass Extinction (“The Big One”), they entirely disappeared. In the absence of living descendants, the identity of these enigmatic shells has been an unsolvable problem, with guesses as to their identity ranging from snails to squid to sipunculid worms or an unspecified “extinct phylum”. 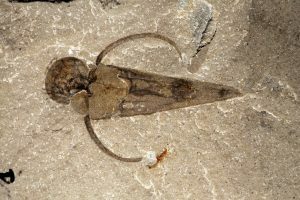 Recently, sites of exceptional fossil preservation such as the Chengjiang, Spence and Burgess Shales have yielded some exciting surprises. These sites preserve partial impressions of the soft (non-mineralized) bodies of these organisms: here a set of tentacles, there a fleshy attachment structure. Taken together, these insights point towards an affinity with an unexpected group, the brachiopods – a once-dominant lineage that still survives today, if only in refugia. This new fossil evidence ties in with controversial reinterpretations of other “small shelly fossils” to paint a new picture of the origins of the brachiopod lineage. Once thought to be ineffective competitors that were pushed aside when clams and other bivalved molluscs rose to dominance, the Cambrian fossil record suggests that brachiopods – via their hyolith ancestors – evolved towards a lifestyle based on thrift and efficiency. Perfectly attuned to nutrient-starved Palaeozoic seas, brachiopods now find themselves ideally suited to marginal environments where they alone can eke out a living.